Thanh Thanh Vietnamese Cuisine\r\n2525 E Arkansas Ln, Arlington. 817-275-2449. Sun-Thu 11am-10pm, Fri-Sat 11am-11pm. Closed Tue. All major credit cards accepted. 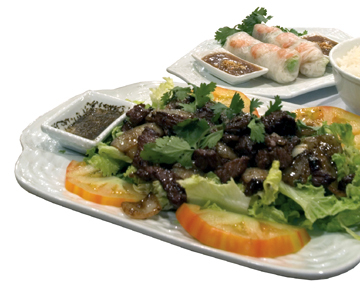 Love � and love of food � are in the air at Thanh Thanh Vietnamese Cuisine. A while back, Thanh Thanh Vietnamese Cuisine relocated across East Arkansas Lane from one strip mall to another. They carpeted the new, spacious locale (an old chain drug store), hung a chandelier from the low ceiling, and did whatever else they could to spruce up the place. As a regular spot for wedding receptions, Thanh Thanh was also fitted with a couple of mini-stages, for live bands, speeches, and tear-drenched marital ceremonies. Sometimes on weekends, a rowdy nuptial celebration will be going on while, a few feet away, restaurant patrons quietly mind their pho. Not surprisingly, perhaps, in an establishment designed to be at least as much venue as restaurant, the food had a mass-catered quality. Still, it hit more often than it missed. The steamed beef p�t� meatballs with glass noodles is technically not an appetizer, though it can be ordered that way. Anyone who relishes a pure beef flavor (without fried or roasted edges) would enjoy these four pinkish-brown mounds studded with green peas and falling apart with every lift of the chopstick/fork. The consistency of the meat was somewhere between pur�ed and ground, which sounds a little iffy, sure, but the taste was exquisite. The glass noodles had considerably less personality, and the plate-sized toasted sesame rice cracker that rode atop the dish like a piece of plaster was too brittle to combine well with the moist flesh. The lotus stem salad with shrimp and pork was more than anyone should expect from a salad. The accompanying white rice crackers (which crackle like Pop Rocks when placed near warm food) were superfluous. Lotus stems are like a cross between hearts of palm and peeled green onions, with the added bonus that you can blow through them like whistles. (They�re perforated.) The tail-on shrimp were firm, the strips of pork white and non-fatty, and the sprinkling of peanut bits introduced an excellent earthy crunch. The clay pot-braised pork and tofu came with a gi-normous side of sticky white rice, a good thing in this case. Sprinkled with a slightly spicy and sweet brown sauce, the dish was inconceivably short on the two main ingredients. Lack of density wasn�t the dish�s only problem. The spices were timid, and the pork pieces a bit limp. The tofu, thankfully, had just the right crispy-outside/hot-silken-inside that makes for flavor that�s not just bearable (like most bean curd) but exciting. On the day of a recent visit, Thanh Thanh seemed merely half-heartedly committed to its Saturday lunch. With the exception of the superior salty fish sauce with lemon grass, all of the condiments offered on a complimentary plate (romaine lettuce, cilantro sprigs, and basil leaves) were dull. The servers acted as if you were invisible but responded generously and politely when you got their attention. Thanh Thanh isn�t great, but it is good enough to bear watching. For lovers of Vietnamese fare, the place just might blossom into the love of a lifetime.